Fort Lamy (Chad) to Stanleyville via Leopoldville 17/10 stage of the Count De Looz-Corswarem, Mahieu and D'Hoore official flight to the Congo via the shortest route over the Libyan desert via Tunis-Sebha-Fort Lamy-Stanleyville. 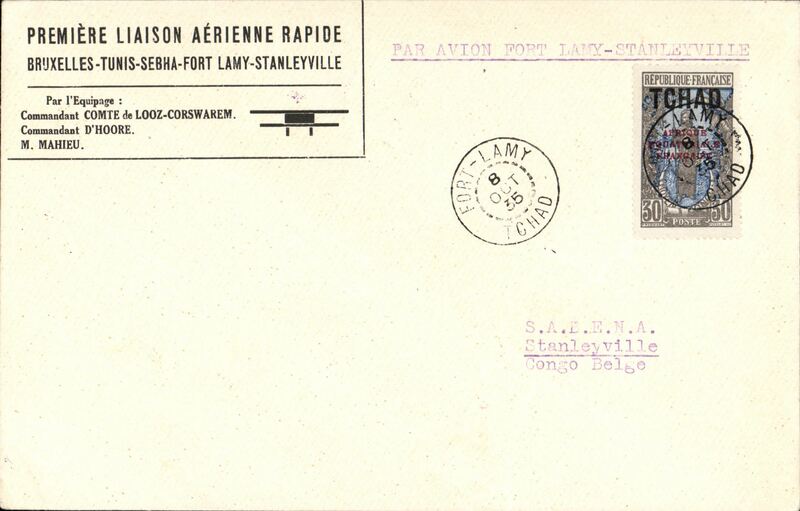 A printed 'Premiere Laison Aerienne Rapide' with names of crew members souvenir corner cover franked Fort Lamy 8 Oct 35 cds, typed 'Par Avion Fort Lamy-Stanleyvill' on front and red four line text re the deferred departure from Brussels, Rare, no more than five items carried on this leg. French Equatorial Africa to Middle Congo, scarce acceptance for carriage on the accelerated Sabena service from Brussels to Elisabethville, Oubangui-Chari to Brazzaville, bs 29/10, plain airmail etiquette cover franked 1F50 canc Oran cds, typed "Inauguration de la bretelle Bangui/Brazzaville-Leopoldville par la Sabena" . 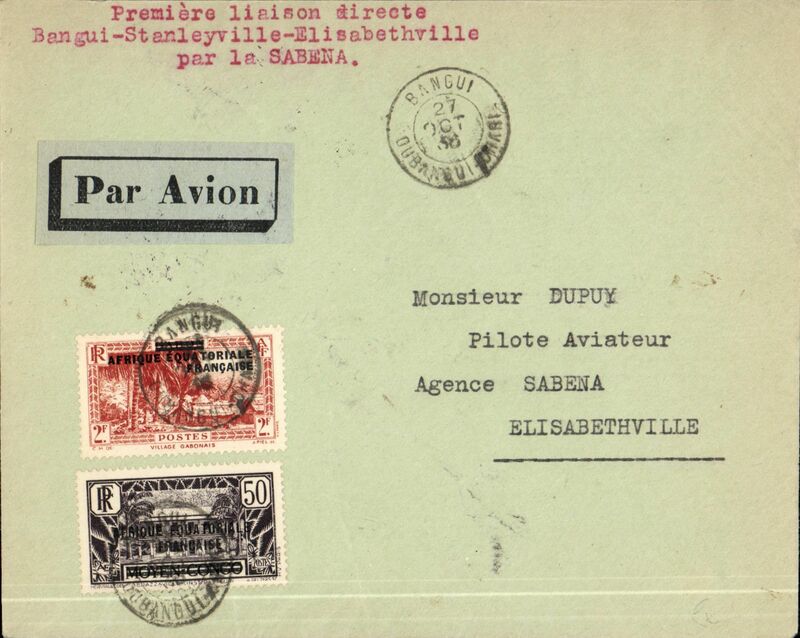 French Equatorial Africa to the Congo, scarce acceptance for carriage on the accelerated Sabena service from Brussels to Elisabethville, Bangui (Oubangui-Chari) to Elisabethville, bs 29/10, plain airmail etiquette cover franked 2F50 canc Oran cds, typed "Premier laison directe/Bangui-Stanleyville-Elisabethville/par la Sabena". 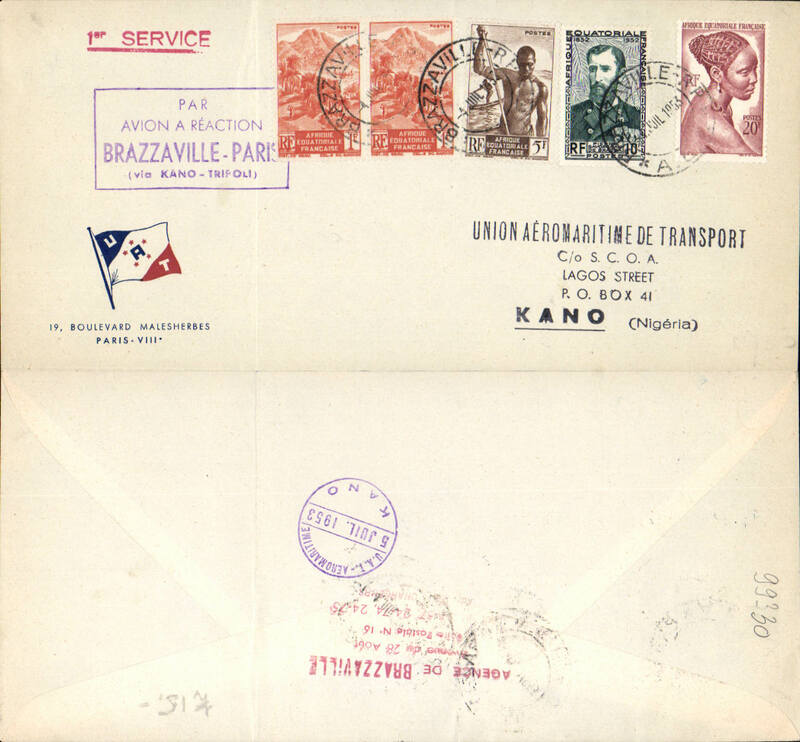 World War II censored airmail cover, Brazzaville to London, via Lagos 20/10 transit cds, blue/grey 'Air Afrique' airmail cover franked 8F50, canc Brazzaville/Moyen Congo cds, sealed plain cream censor tape tied by 'Control Postal/Commission A (Middle Congo) and pointed oval 'Ouvert/L'Autorite Militaire (Middle Congo) censor marks, also small black 'A1' in circle Middle Congo censor mark. The Air Afrique service ceased in June 1940 following the Franco-German armistice. So this cover was carried 40 miles across the Congo River to Leopoldville (Belgian Congo) and then flown to Lagos by SABENA, and OAT by the BOAC flying boat service to England. Good routing. 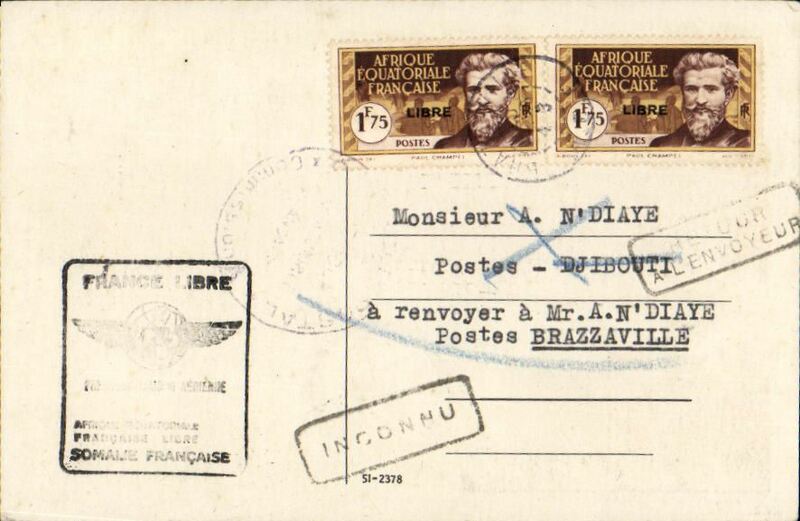 Force Aerienne Francais Libres (Free French Air Force (FAFL), F/F Brazzaville to Djibouti, 25/2 arrival ds verso, anti-Hitler propaganda card franked 3.50f (Stanley Gibbons # 136 pair), special black boxed flight cachet on face. 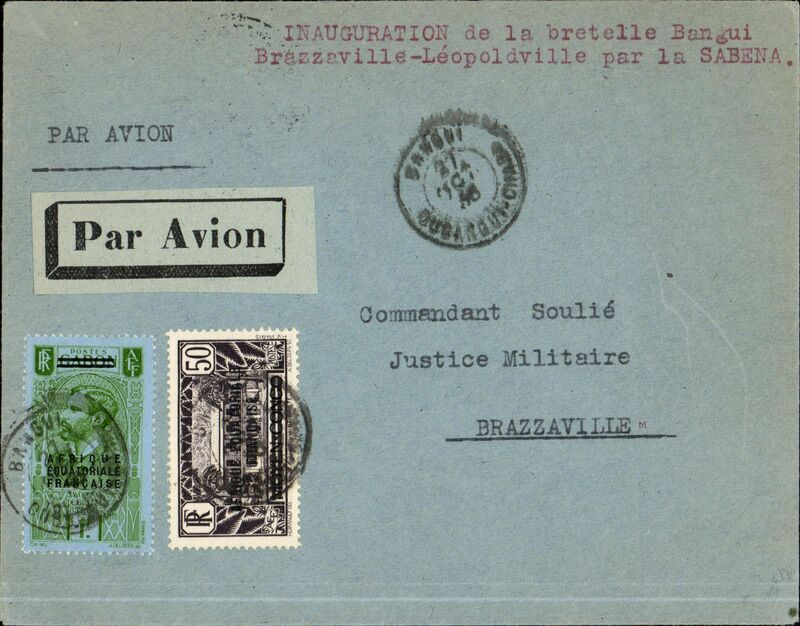 also boxed "inconnu" & "retour/a l'envoyeur" cachets returned to sender with eventual Brazzaville arrival of 10 March Brazzavile was De Gaule's 'capital of Free France' in 1943. A fine and unusual world war II airmail item. UAT Aeromaritime, F/F Comet 1, Brazzaville to Kano, bs 5/7, fine strike violet boxed Brazzavile-Paris (via Kano-Tripoli) flight cachet, red/white/blue UATcompany cover with flag logo in lower lh corner, franked 17F20. Ironed vertical crease.